1 vol. ; 16 pgs. : ill. ; 8.5 in. x 11.5 in. 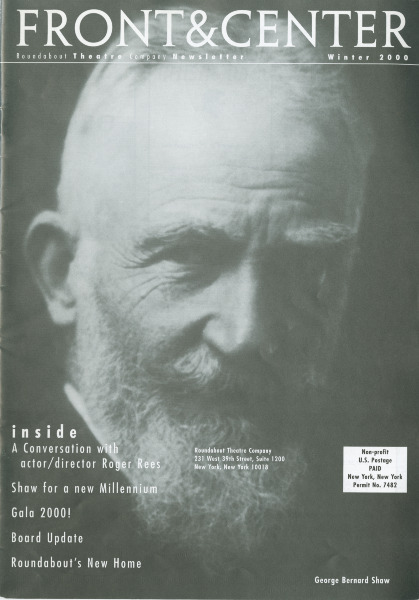 Features letter from artistic director Todd Haimes, article on George Bernard Shaw (Arms and the Man), interview with Roger Rees, new board members (Jeffrey S. Maurer, Lionel L. Nowell, Thomas E. Tuft), opening night photographs (Give Me Your Answer, Do! and The Rainmaker), alumni profile (featuring Calista Flockhart), Roundabout venues (Gramercy Theatre, 42nd Street [not-yet-be-named American Airlines], and Studio 54), article on Anton Chekhov (Uncle Vanya), subscriber information.